This image taken on May 8, 2015, shows Pluto in the latest series of New Horizons Long Range Reconnaissance Imager (LORRI) photos, compared to a LORRI image taken on April 12. New photos taken by a spacecraft zooming toward Pluto reveal more intriguing details of the dwarf planet's complex and varied surface. NASA's New Horizons probe, which will make the first-ever flyby of Pluto on July 14, captured the images with its long-range camera from May 8 through May 12, when the spacecraft was a bit less than 50 million miles (80 million kilometers) from the dwarf planet. 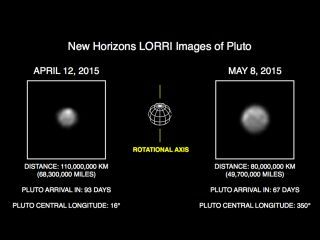 This image taken on May 10, 2015, shows Pluto in the latest series of New Horizons Long Range Reconnaissance Imager (LORRI) photos, compared to a LORRI image taken on April 15. "These images also continue to support the hypothesis that Pluto has a polar cap whose extent varies with longitude," Stern added. "We’ll be able to make a definitive determination of the polar bright region’s iciness when we get compositional spectroscopy of that region in July." Mission scientists first noticed the surface variations, which manifest as patches of differing brightness, in images New Horizons took in mid-April, when the probe was about 70 million miles (113 million km) from Pluto. The new photos are more detailed, depicting Pluto with twice as many pixels as last month's images did, NASA officials said. This image taken on May 12, 2015, shows Pluto in the latest series of New Horizons Long Range Reconnaissance Imager (LORRI) photos, compared to a LORRI image taken on April 16. New Horizons' Pluto views will keep getting better, of course, with the highlight coming on July 14, when the spacecraft cruises just 7,800 miles (12,500 km) from the dwarf planet's surface. Closest-approach images will be about 5,000 times sharper than the May 8 to May 12 photos, mission scientists said. "As New Horizons closes in on Pluto, it's transforming from a point of light to a planetary object of intense interest," Jim Green, director of NASA's Planetary Science division, said in the same statement. "We're in for an exciting ride for the next seven weeks."